PfKMT1 and genes enriched in H3K9me3 are positioned at the nuclear periphery. Immuno-fluorescence assays using antibodies against H3K9me3 H3 (right) and the P. falciparum putative H3K9 methyltransferase PfKMT1 (left). 3D7 parasites are in late schizont (main image) and ring stage (top-right square). 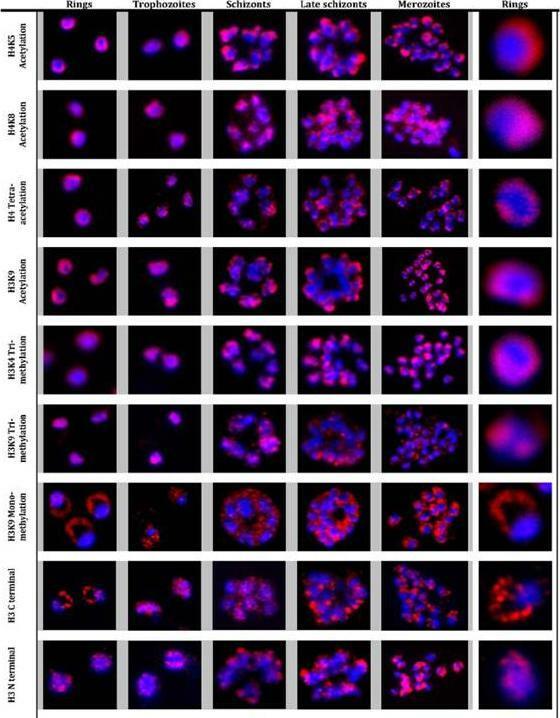 Nuclear DNA was detected with DAPI (red).Lopez-Rubio JJ, Mancio-Silva L, Scherf A. Genome-wide analysis of heterochromatin associates clonally variant gene regulation with perinuclear repressive centers in malaria parasites. Cell Host Microbe. 2009 5:179-90. 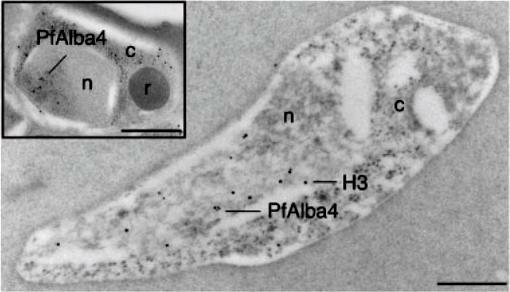 Transcription sites form a distinct compartment in the nucleus of P. falciparum. 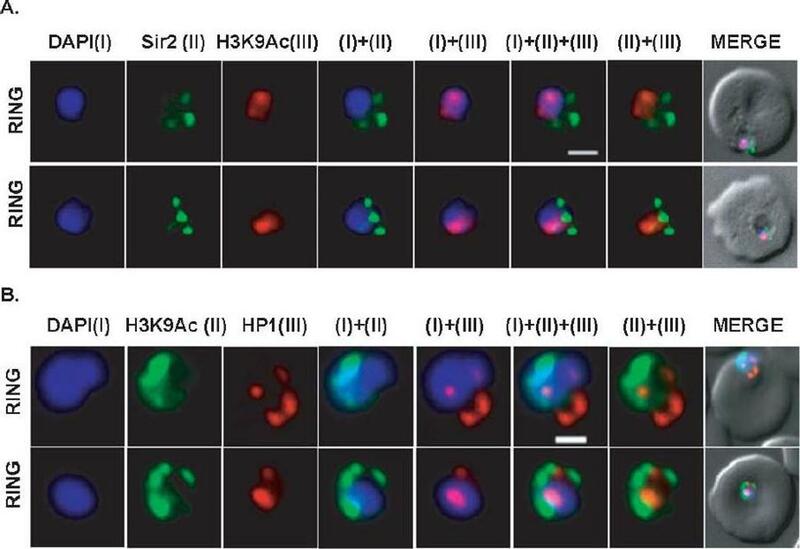 Immunofluorescence assay for nascent RNAs of ring stage parasites labeled with BrUTP (BrRNA, green) and the compartments of acetylated H4 (H4ac, active chromatin); a proposed histone marker of nascent transcription (H3K79me3; PfSir2A (silencing compartment); and Nop1 (nucleolar compartment). DNA was labeled by DAPI, in blue. Bars, 1 mm.Moraes CB, Dorval T, Contreras-Dominguez M, Dossin Fde M, Hansen MA, Genovesio A, Freitas-Junior LH. Transcription sites are developmentally regulated during the asexual cycle of Plasmodium falciparum. PLoS One. 2013;8(2):e55539. Immunofluorescence analysis of histone modifications in P. falciparum. 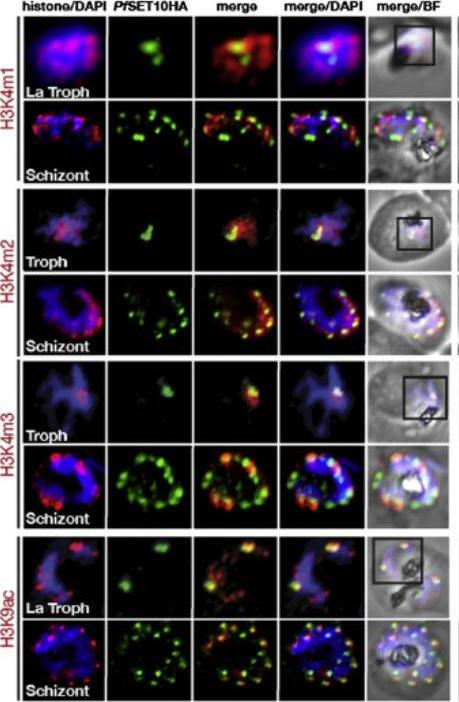 Localization of histone modifications were analyzed with the ring, trophozoite, schizont, late schizont and merozoite stages of the IDC. IFAs were carried out with antibodies against specific histone 3 and 4 lysine residue acetylations: H3K9Ac, H4K5Ac, H4K8Ac, and H4Ac4, as well as methylations: H3K4Me3, H3K9Me3 and H3K9Me1, and unmodified histone H3. Nuclear DNA was stained with DAPI (blue). 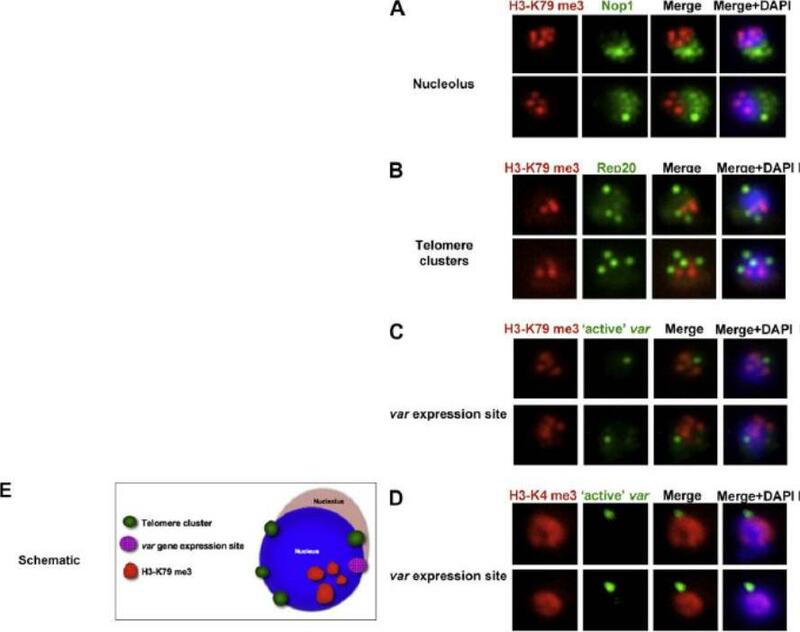 All modifications, with the exception of H3K9Me1 and H3 (antibody raised against H3 C terminal), showed specific and distinct localization in the nucleus in all the stages. In contrast, H3K9Me1 was localized mainly outside the nucleus with very low levels detected inside the nucleus. Luah YH, Chaal BK, Ong EZ, Bozdech Z. A moonlighting function of Plasmodium falciparum histone 3, mono-methylated at lysine 9? PLoS One. 2010 5(4):e10252. 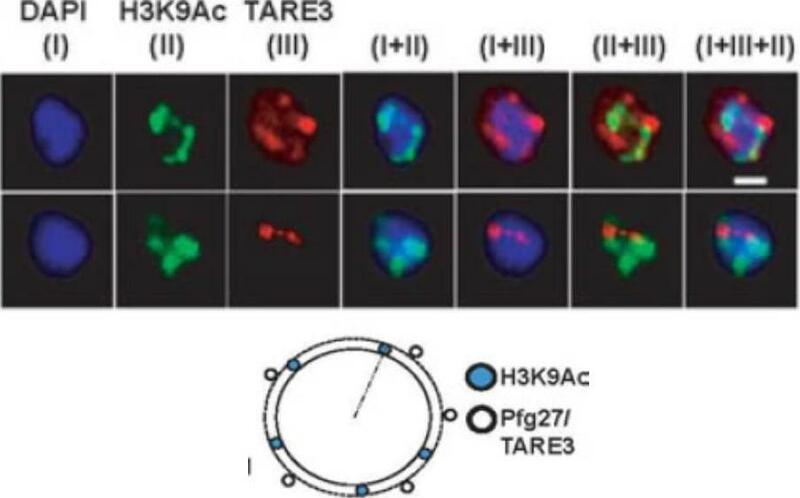 H3K9Me1 localized to the parasitophorous vacuole during the ring stage. 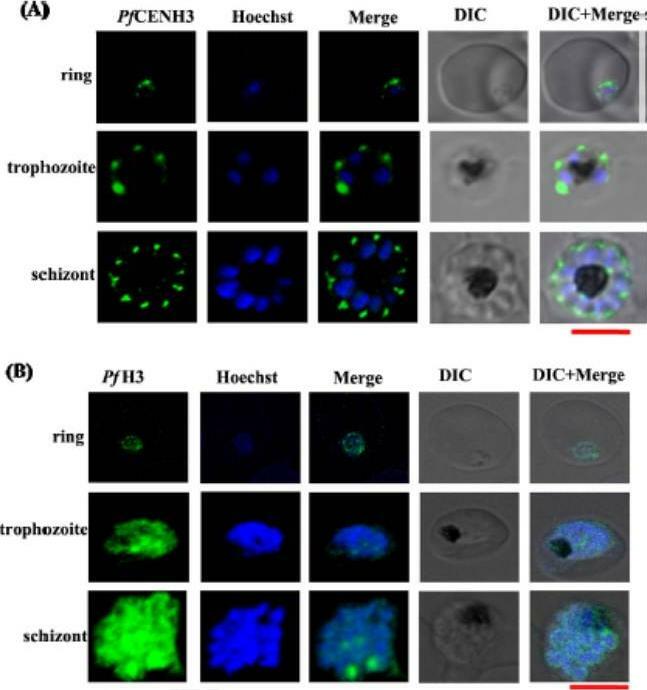 Co-localization of H3K9Me1 with Etramp 2 (A) and 4 (B) was performed in ring and schizont stage parasites respectively. 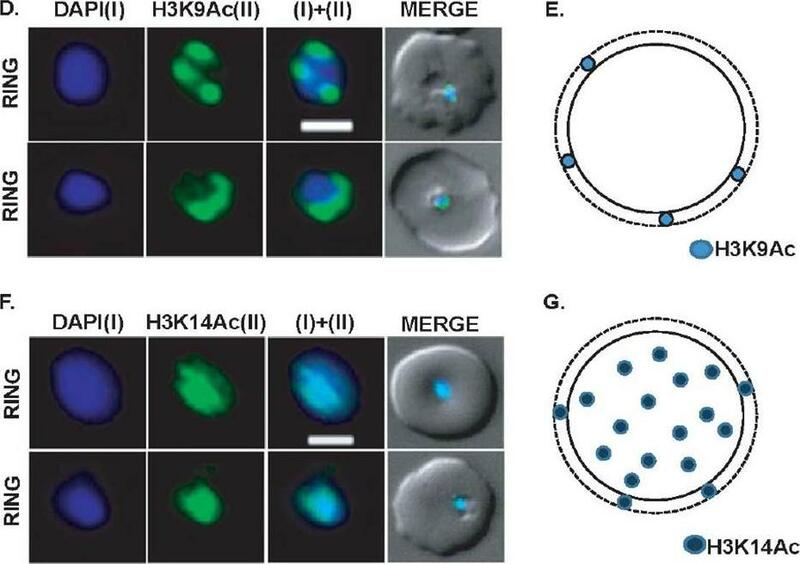 Similarly, co-localization of H4K5Ac with Etramp 2 (C) and 4 (D) was performed in ring and schizont stage parasites respectively. H3K9Me1/H4K5Ac and Etramp 2/4 were stained red and green respectively. DAPI stained nuclear DNA blue. Yellow and white arrows indicate foci of more intense fluorescence produced by H3K9Me1 and Etramp labeling respectively. 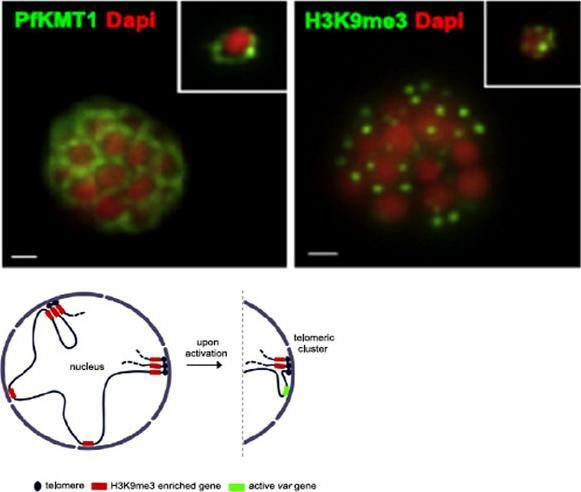 In ring stage parasites, compared to schizonts, H3K9Me1 partially co-localized with Etramp 2 indicating localization to different compartments of the PV. H4K5Ac was localized solely to the nucleus and did not co-localize with either Etramp 2 or 4.Luah YH, Chaal BK, Ong EZ, Bozdech Z. A moonlighting function of Plasmodium falciparum histone 3, mono-methylated at lysine 9? PLoS One. 2010 5(4):e10252. Preparation of crude P. falciparum nuclei for proteomic analysis. (a) Visual assessment of the crude nuclear preparation. 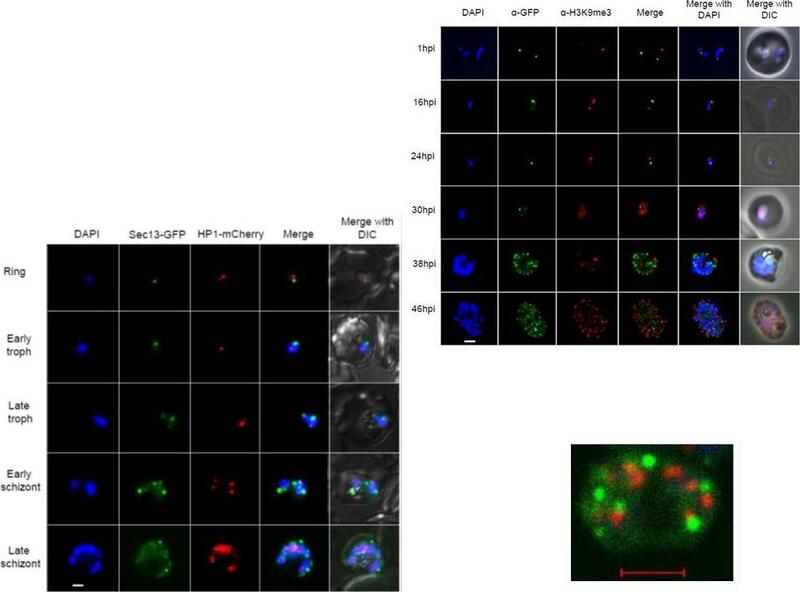 Intact parasites (control) and isolated nuclei were stained with DAPI and analysed by DIC and fluorescence microscopy. Scale bar 2 mm. 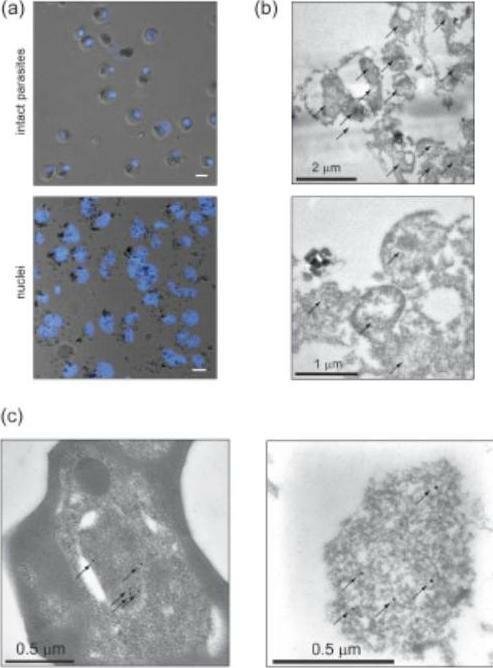 (b) TEM analysis of isolated nuclei shows intact as well as damaged nuclei and very little contamination from other organelles. Arrows indicate individual nuclei. 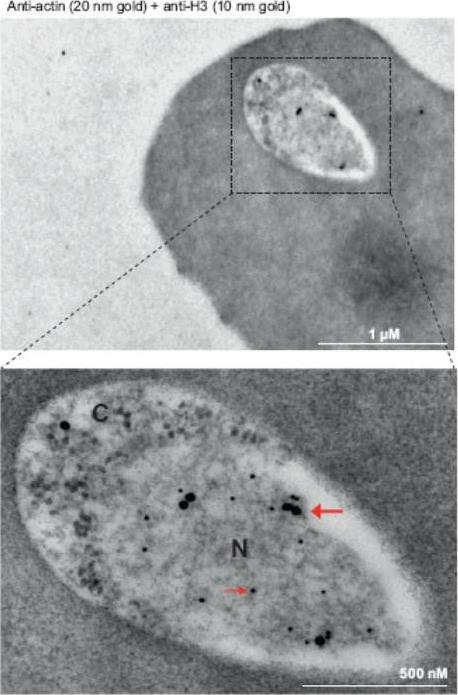 (c) Immunoelectron microscopy verifies the identity of nuclei. Anti-H3K4me3 antibodies were used to label nuclei in intact cells (left panel) and in the nuclear preparation (right panel) (arrows). Oehring SC, Woodcroft BJ, Moes S, Wetzel J, Dietz O, Pulfer A, Dekiwadia C, Maeser P, Flueck C, Witmer K, Brancucci NM, Niederwieser I, Jenoe P, Ralph SA, Voss TS. Organellar proteomics reveals hundreds of novel nuclear proteins in the malaria parasite Plasmodium falciparum. Genome Biol. 2012 Nov 26;13(11):R108. Colocalization of histone H3 marks with PfSET10. Shown are from top to bottom: H3K4m1, H3K4m2, H3K4m3, and H3K9ac. The histone marks (red) were detected using specific antibodies and colocalized with PfSET10-HA (green) using anti-HA antibodies. Nucleus position is shown by DAPI staining. PfSET10 colocalized with the H3K4me1, me2, and me3 marks in the perinuclear region, which is also marked by H3K9ac Volz JC, Bártfai R, Petter M, Langer C, Josling GA, Tsuboi T, Schwach F, Baum J, Rayner JC, Stunnenberg HG, Duffy MF, Cowman AF. PfSET10, a Plasmodium falciparum methyltransferase, maintains the active var gene in a poised state during parasite division. Cell Host Microbe. 2012 11(1):7-18. Immunoelectron microscopy of 3D7 rings. Double labeling with mouse anti-Pfactin-I (20 nm gold grain, bold arrow) and rabbit anti-histone H3 (10 nm gold grain, slim arrow). N, nucleus; C, cytoplasm. Gold grains are virtually confined to the nuclear periphery.Zhang Q, Huang Y, Zhang Y, Fang X, Claes A, Duchateau M, Namane A, Lopez-Rubio JJ, Pan W, Scherf A. A critical role of perinuclear filamentous actin in spatial repositioning and mutually exclusive expression of virulence genes in malaria parasites. Cell Host Microbe. 2011 10:451-63. Co-localisation of H3-K79me3 with known cellular compartments. 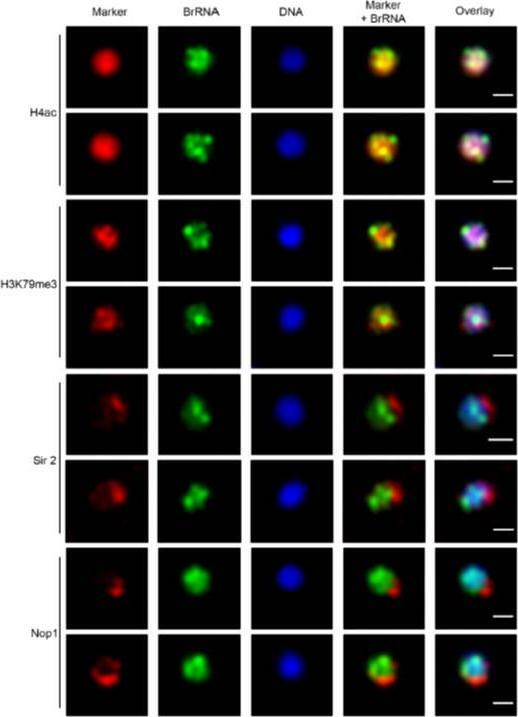 A. Nucleolus: Double labelling IFAs with antibodies against H3-K79me3 and nucleolus marker, PfNop1. B. Telomere clusters: IFeFISH analysis between H3-K79me3 (red) and Rep20 (green). C. Active var gene: IF-FISH analysis between H3-K79me3 (red) and active var gene (green). D. Active var gene colocalisation with activating mark, H3-K4me3. IF-FISH analysis between H3-K4me3 (red) and active var gene (green). DAPI stained nucleus in blue. Font colour represents corresponding fluorescein labelled antibody. Scale bar depicts 1 mm. E. Schematic of the dynamic compartmen-talisation of the P. falciparum nucleus. 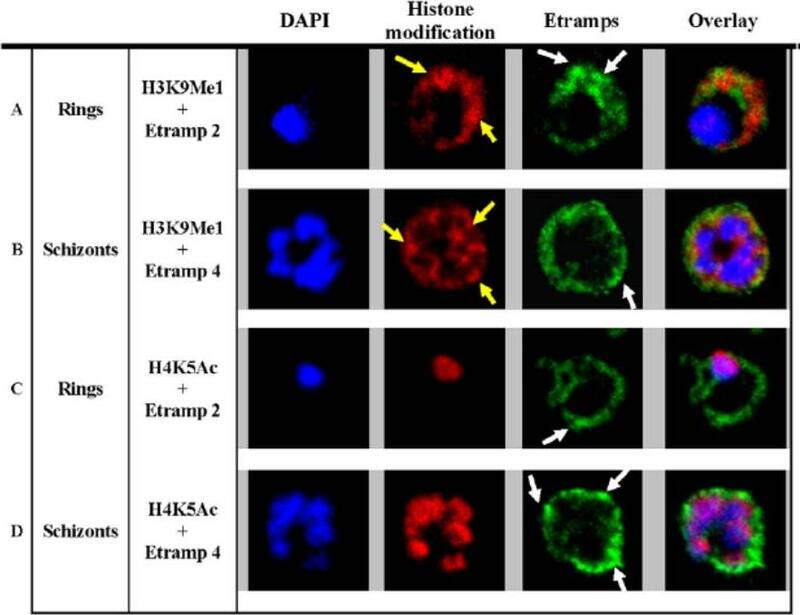 The distinct sub-nuclear distribution of histone methylation modification, taking example of H3-K79me3 as observed in this study. Known compartments compatible with active transcription are indicated. H3-K79me3 occupies a distinct zone.Issar N, Ralph SA, Mancio-Silva L, Keeling C, Scherf A. Differential sub-nuclear localisation of repressive and activating histone methyl modifications in P. falciparum. Microbes Infect. 2009 11:403-7.